The twenty-third Psalm is a beloved Scripture passage people turn to again and again. The soul-restoring words of the psalm combine with complementary verses and quotes on every page of this refreshing journal. ^^Written by a shepherd about the One who so lovingly takes care of him, this best-known psalm is filled with symbols of comfort, protection, and security. Images of green pastures and quiet waters refresh the weary. Assurance that the Good Shepherd will guide and be with them offers hope even in the darkest valley. ^^Promises of abundant goodness and mercy encourage joyful trust.^^Verses and quotations - gathered into themes taken from each line of the familiar chapter - create a timeless message of God's loving care. Beside the still waters of quiet reflection, journal users will find the words for their own thoughts and prayers. 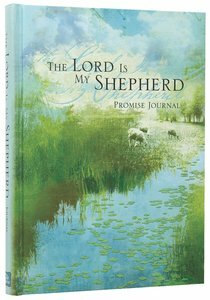 About "Promise Journal: The Lord is My Shepherd"